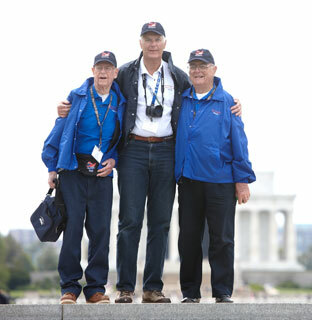 WWII Veteran, Brad Hoffman (6/24/1926-7/22/2012) in front of the Freedom Wall at the WWII Memorial, Mission #8, May 7, 2012 (The Freedom Wall is on the west side of the WWII Memorial, with a view of the Reflecting Pool and Lincoln Memorial behind it. 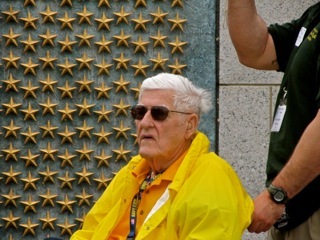 The wall has 4,048 gold stars, each representing 100 Americans who died in the war. In front of the wall lies the message “Here we mark the price of freedom”.